Bonnie's Blog: 3D design for K-12 and beyond: Finally! 3D Geometry! Math teachers often lament the fact that 3D objects such as Platonic and Archimedean solids are hard to teach, because it's hard for students (and even teachers themselves) to visualize these objects. Well those days are over! It's quite easy to make most of these objects in SketchUp, and when you can see it, you understand it. After many months of hard (but fun) work, I've released two new books on 3D geometry, which show you exactly how to create all of these cool objects. Click the book covers below for more info. 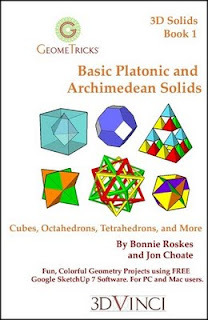 Book 1 focuses on cubes, octahedrons, and tetrahedons, and the various objects that can be derived from them. 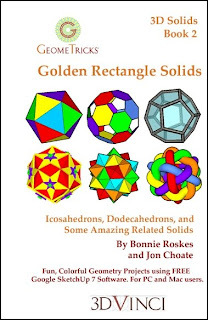 Book 2 shows all the solids that can be made from a "golden rectangle" - icosahedrons, dodecahedrons, and lots of amazing derivative objects. Want to know what's in each chapter? Here are chapters details for Book 1, and chapter details for Book 2. (The book links above take you to the PDF page for each book, but they are also available in print. My co-author, Jon Choate from Groton School, thinks that SketchUp can revolutionize the way geometry is taught. I hope these books help pave the way! are you kidding? do not be so modest. the geometricks series is for a far wider audience than K-12 kids! every architect (like me) can benefit from it for both spatial creation and surface design.